In February 1940, the United States Army Air Corps (AAC) issued Request for Data R40-C to various engine and aircraft manufacturers. R40-C encouraged aircraft manufacturers to propose unorthodox aircraft capable of at least 450 mph (724 km/h), but preferably 525 mph (845 km/h), and to meet other requirements outlined in Type Specification XC-622. R40-C also asked aircraft engine manufacturers to develop new power plants. Initially, a total of 26 aircraft designs were submitted by six selected aircraft companies and included a mix of eight different engines from four engine companies. Republic Aviation’s entry carried the company designation AP-12. 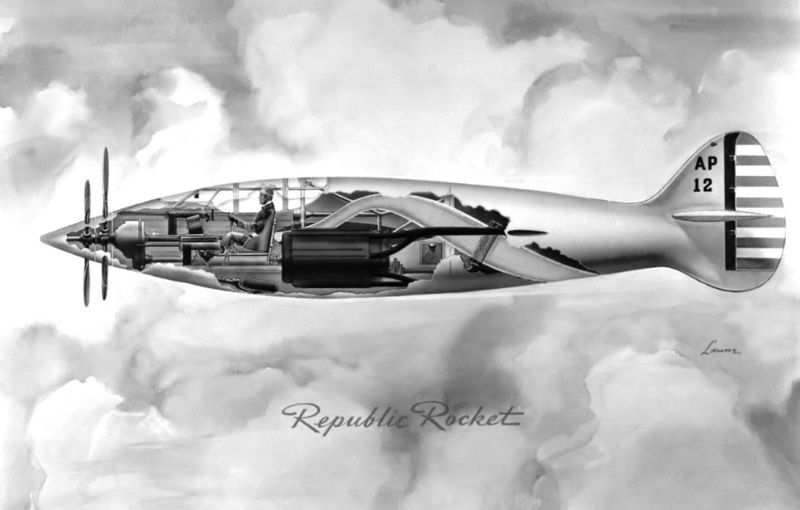 The AP-12 Rocket was Republic’s entry into the R40-C fighter competition. Note the mid-fuselage-mounted Wright R-2160 Tornado engine. Like almost all of the other R40-C entries, the Republic AP-12 ‘Rocket’ was not a conventional aircraft. The AP-12 had a streamlined, cigar-shaped fuselage and utilized a tricycle undercarriage. The aircraft’s Wright R-2160 Tornado engine was placed behind the pilot. The engine’s extension shaft ran under the cockpit and drove a six-blade, contra-rotating airscrew at the front of the aircraft. Four machine guns were installed in the AP-12’s nose and fired through the propellers, and an additional machine gun was installed in each wing, outside of the propeller arc. A 20 mm cannon was installed in the nose of the aircraft and fired through the propeller hub. After the AP-12 placed 13th out of the R40-C entries, Republic literally went back to the drawing board and created a new design, designated AP-18. The AP-18 possessed some of the same lines and used the same engine as the AP-12; however, the R-2160 engine was now installed in the nose of the aircraft. Republic submitted its AP-18 design to the AAC in July 1941 and was awarded a contract in December 1941 to produce two prototypes of the aircraft, designated XP-69 (it also carried the “Materiel, Experimental” project designation MX-162). This XP-69 drawing dated 15 September 1941 clearly shows the Wright Tornado installed in the nose of the aircraft, with the turbosupercharger and its ancillary equipment mounted behind the cockpit. While the leading edge is distorted, the trailing edge shows the inner wing section perpendicular to the fuselage, then tapering toward the wing tip. This drawing was discovered in the National Archives by Kimble McCutcheon of the Aircraft Engine Historical Society. The Republic XP-69 was an all-metal, high-altitude interceptor fighter with a conventional layout. The aircraft was powered by a 42-cylinder R-2160 engine that produced 2,500 hp (1,864 kW) at 4,600 rpm and was installed in a normal manner, without an extension shaft. The engine drove a 13 ft 8 in (4.17 m) diameter, six-blade, contra-rotating propeller built by Hamilton Standard. The turbosupercharger, intercoolers, radiator, and oil coolers were all positioned behind the cockpit. The scoop mounted under the cockpit brought in air for the radiator, oil coolers, intercoolers, and turbosupercharger via a complex series of ducts. The scoop also incorporated a boundary layer air bleed duct. 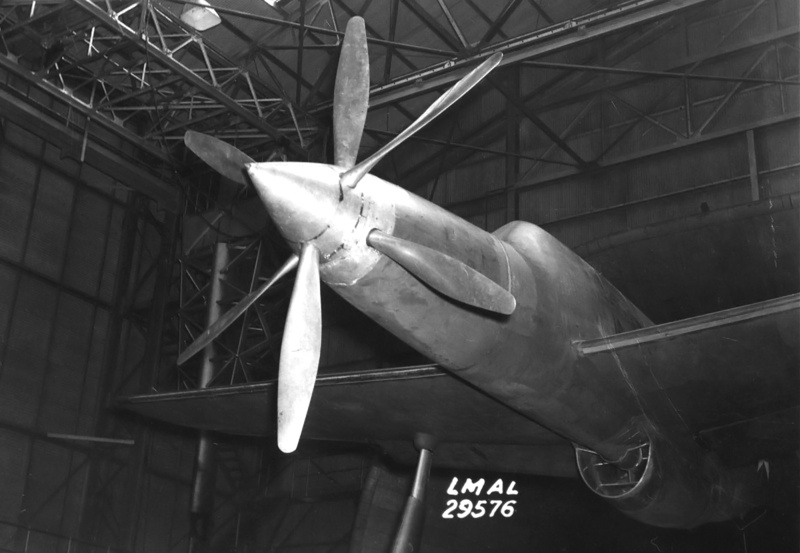 Initially, four air exit doors were located under the fuselage, but the exits were later relocated, with two on each side of the XP-69 (the oil cooler was the lower exit and the intercooler the upper). However, radiator and boundary layer air as well as exhaust from the turbosupercharger exited from the bottom of the aircraft. Most sources contend that the R-2160 engine was installed behind the XP-69’s cockpit. However, all of the equipment and associated ducting that was installed behind the cockpit left no room for anything else. In addition, a drawing dated 15 September 1941 found in the U.S. National Archives by Kimble McCutcheon clearly shows the Wright Tornado installed in the nose of the aircraft. The XP-69 utilized a pressurized cockpit in a fairly narrow fuselage, and its standard taildragger landing gear was fully retractable. The aircraft’s armament consisted of two .50 cal machine guns and one 37 mm cannon installed in each wing, outboard of the main landing gear. The machine guns had 320 rpg, and the cannons had 40 rpg. Some sources state an alternative armament installation consisted of six .50 cal machine guns in the wings and no cannons. Initially, the leading and trailing edges of the inboard wing sections were exactly perpendicular to the fuselage. This was later revised so that the wing’s taper was unchanged throughout its leading and trailing edges. Slotted flaps extended across about 50 percent of the wing’s trailing edge to help lower the heavy aircraft’s landing speed. The XP-69 was a large aircraft with a wingspan of 52 ft (15.85 m), a length of 51 ft 8 in (15.75 m), and a height of 17 ft 3 in (5.26 m). The aircraft had a top speed of 450 mph (724 km/h) at 35,000 ft (10,668 m), an initial climb rate of 2,750 fpm (13.97 m/s), and a ceiling of 48,900 ft (14,905 m). Eight wing fuel tanks provided a total capacity of 386 gal (1,461 L), and a 114 gal (432 L) fuselage tank brought the aircraft’s total fuel capacity to 500 gal (1,893 L), which provided a maximum range of 1,800 miles (2,897 km). 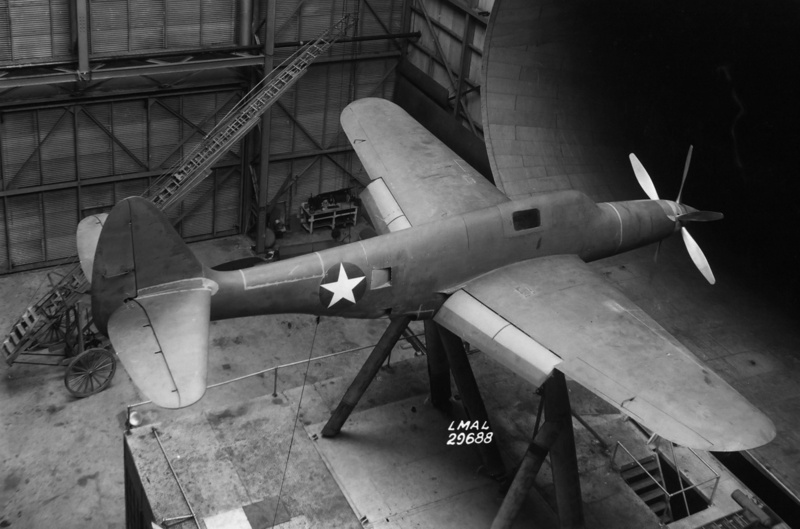 Wind tunnel tests were conducted with a 75 gal (284 L) drop tank under each wing of the aircraft. The XP-69 had an empty weight of 15,595 lb (7,074 kg), a gross weight of 18,655 lb (8,462 kg), and a maximum weight of 26,164 lb (11,868 kg). A 1/20-scale XP-69 model was used for spin recovery tests, the results of which were generally satisfactory—although, recovery was problematic at 30,000 ft (9,144 m). 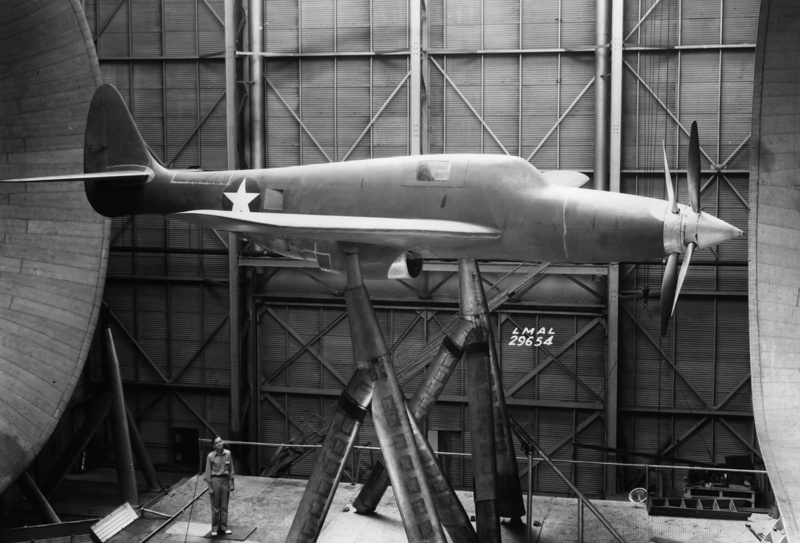 A 3/4-scale model of the XP-69 was completed around June 1942 and began wind tunnel tests in August. The extensive tests were to analyze and evaluate the aircraft’s stability, controls, and cooling system and included fitting the model with 10 ft (3.0 m) diameter, contra-rotating propellers driven by two 25 hp (19 kW) electric motors in the fuselage. The tests indicated some longitudinal instability; the forecasted rate of roll was inadequate, and the estimated control forces for full aileron deflection were excessive. The XP-69 would utilize a control yoke, which would provide a certain degree of mechanical advantage over a control stick. Tests also revealed that the cooling system was not as efficient as expected and required some revision. Construction of the first prototype began in November 1942 and incorporated changes shown necessary from the various wind tunnel experiments. While development of the XP-69 continued, the R-2160 engine was delayed with design issues that, in turn, would delay the aircraft. Also, a miscommunication had occurred: Republic thought the first engines would be capable of 2,500 hp (1,864 kW) at 4,600 rpm. In reality, the R-2160 would produce only 2,350 hp (1,752 kW) at 4,150 rpm; 2,500 hp (1,864 kW) was the engine’s developmental goal. The reduced power would inhibit the XP-69’s performance, and its 450 (724 km/h) mph top speed was already seen as optimistic. Republic wanted to end work on the XP-69 and focus their resources on an alternative project. The company believed their AP-19 design (in a way, a Pratt & Whitney R-4360-powered P-47) held more potential and could fly sooner than the XP-69. The AP-19 (designated XP-72) was designed for and proposed to the AAC at the same time as the AP-18/XP-69. Since the AAC wanted an R-2160-powered fighter as soon as possible, Republic’s AP-18/XP-69 design was contracted, as it was the most appealing candidate. But now, with the engine issues affecting the XP-69, the XP-72 could no longer be overlooked as the superior aircraft. The XP-69 was cancelled on 11 May 1943, and two prototypes of Republic’s XP-72 were ordered on 18 June 1943. The Wright R-2160 Tornado was cancelled on 12 February 1944. Note: Most sources list the XP-69’s wingspan as 51 ft 8 in (15.75 m) and its length as 51 ft 6 in (15.70 m). 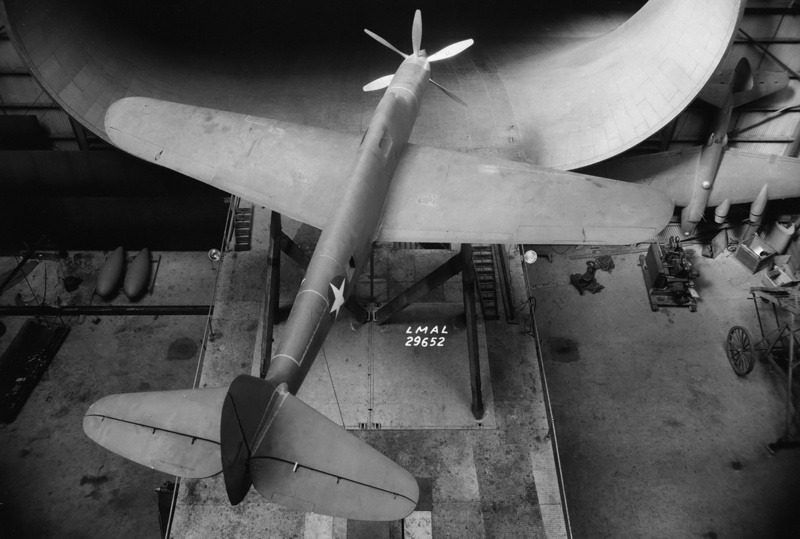 The dimensions given in this article, a 52 ft (15.85 m) wingspan and a 51 ft 8 in (15.75 m) length, come from two NACA reports from the 1940s. This entry was posted in Aircraft, World War II on 7 May 2016 by William Pearce. I have a side view of that 3/4 model, sans propellors. 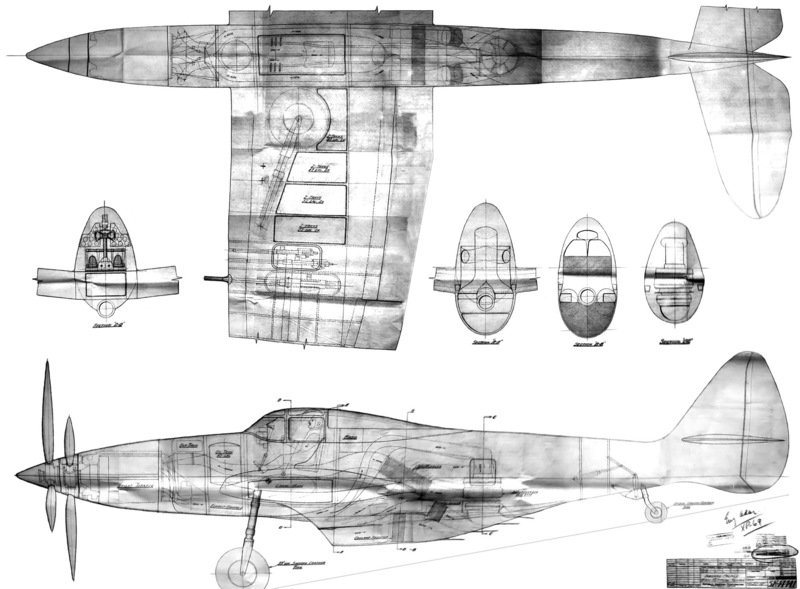 A line drawing (probably a proposed change) shows a cut down rear fuselage with a bubble canopy a la P-51D. The P-72 was built and flown with the 3,500 hp P&W R-4360-13 Wasp Major.The second prototype, S.N. 43-36599 looked very much like a pregnant P-47 with a counter rotating propellor. Top speed of the second prototype was 504 mph, although performance of both of them was similar. Yes, the XP-72 seemed like one incredible aircraft. It is a shame that neither of the two examples survived. Were the air exit ducts manually operated, or did they open when the air pressure within the fuselage reached a certain point? I have not found anything that specifies how the doors were operated. I would assume that they would be automatic with a manual override, as trying to keep track of so many variables while in combat would be overwhelming. I would also assume that they would be thermostatically controlled, opening more as the temperature (of the radiator, oil cooler, or intercooler) rose. Do you have any additional information on the R-2160 engine? My understanding is that a four-stroke radial engine must have an odd number of cylinders per bank in order to have a smooth and even firing order. I’ve never found an exception to that rule, so the six-cylinders-per-bank design of the R-2160 would suggest it was a two-stroke. I couldn’t find anything in the (limited) information I saw online that mentioned whether it was a two-stroke or a four-stroke design. Sounds like an interesting engine, but there doesn’t seem to be much information available. Your understanding is correct, and the four-stroke R-2160 Tornado is no exception. With the R-2160, seven cylinders were positioned radially around each crankpin, and there were six crankpins along the crankshaft. So, when the engine was viewed from the side, each vertical row had seven cylinders, while each horizontal bank had six cylinders. Have a look at this link, which shows the engine during its restoration. You can see in the front view seven banks of cylinders positioned around the crankcase. Also, the CAD drawing will give you a peek at the madness inside the R-2160. The best info on the R-2160 can be found in Tornado: Wright Aero’s Last Liquid-Cooled Piston Engine by Kimble D. McCutcheon (2001). Ah, I see my mistake now: I’m used to seeing radials described in terms of their number of rows, and I misinterpreted “banks” as “rows.” I suppose with the Tornado being liquid-cooled, there is no reason to stagger the rows to get air flow to the rear cylinders, and as a result the cylinders line up more like “banks.” Makes sense now, anyway. Thanks for the explanation, and for the interesting article.